One of the most significant features of Cloud Computing is the ability to operate specific instances of a software application on a shared environment while keeping processes and data organizationally separated. But what if you are a national or global organization that wants both the benefits of shared resources and business unit separation without losing visibility to the whole operation? The answer to this question is resolved by many organizations through the implementation of ServiceCentral’s Service Management Software Solution in a Private Cloud. ServiceCentral’s group segmentation is designed to keep operations and workflows smooth and streamlined. 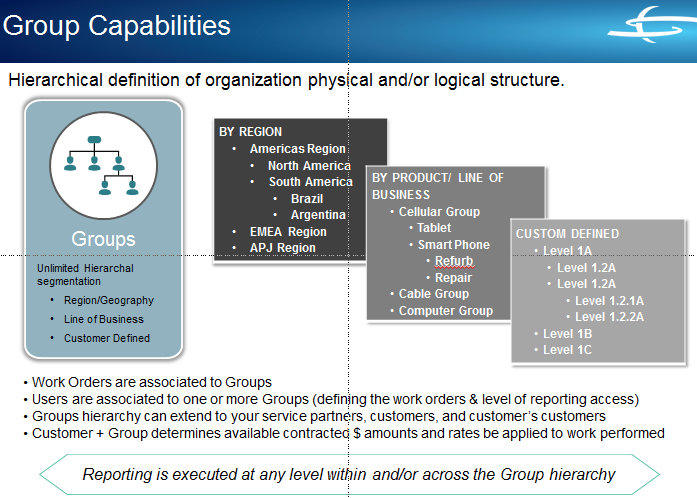 Groups may be divided hierarchically by region, product-line, or any other custom defined variable. Users are then associated to one or more Groups, which define the work orders available for access, as well as any reporting if you are a manager. Group hierarchy extends to your service partners, customers, and customer’s customers. Additionally, group can be used in conjunction with other variables and contracted dollar amounts so the appropriate rates can be applied to the work performed. ServiceCentral’s software suite aims to bring all of your after-market services together on one single platform to allow for optimal progress, operations, and productivity to help keep your business focused on revenue and customer satisfaction. Another key feature of ServiceCentral software, is that the software can be used on any type of device, anywhere, anytime, with 100% web-based applications and multi-language capabilities.